Fluidall’s stackable poly tanks are available in many capacities and the tanks can be accessorized with fully equipped dispense equipment and configured with mobile bases for dispensing and refilling fluids conveniently where you need to be. Our Tote-A-Lube stackable poly tanks are available in many capacities from 35 to 330 gallons. Tote-A-Lube tanks are the most economical stackable tank, and our T130 tank is the most popular tank capacity. This 130 gallon tank can stack 4 tanks high in one footprint! 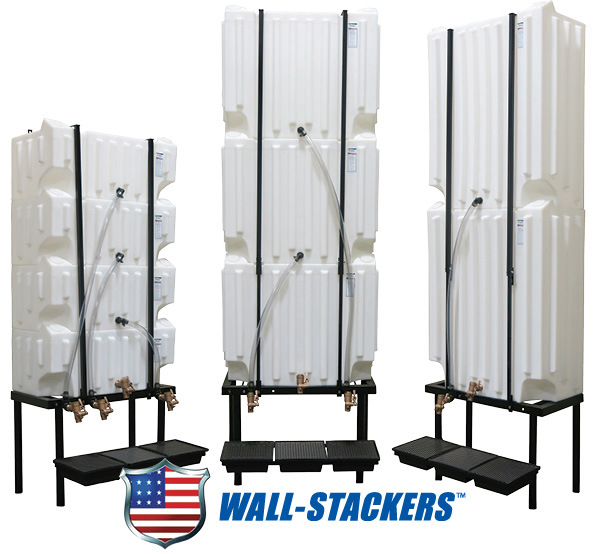 Our other stackable tank line are the space-saving Wall-Stacker tanks, available in 32, 71 and 115 gallon capacities, and the Wall-Stacker tanks are only 19 inches deep. 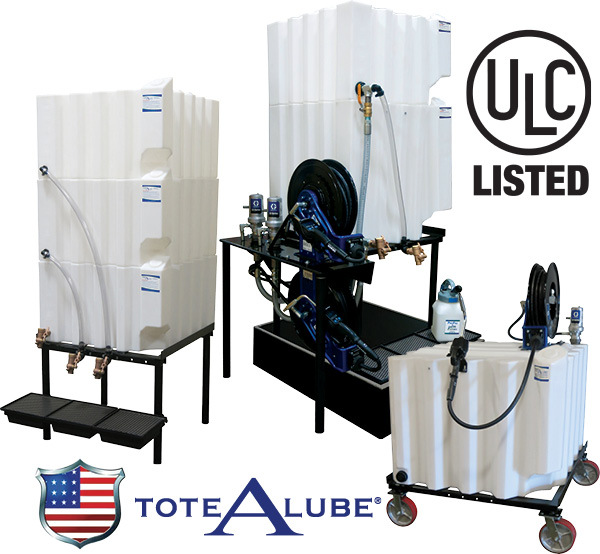 Tote-A-Lube bulk storage solutions are the original stackable poly tanks. These storage tanks are deal for storing multiple fluids, oils and lubricants. Fluidall’s Tote-A-Lube tanks are the solution to all of your fluid storage and handling needs. These tanks can be stacked up to four tanks high and configured with pump packages or gravity feed dispense, SPCC compliant secondary containment, filtration panels, oil dispense bars, drip trays, stands of various heights, pump/reel mounting shelves and brackets, can be bolted to the floor securely, and can be made into mobile fluid storage systems with caster wheels and forkliftable skids. Space saving Wall-Stacker poly tanks maximize valuable space with the smallest possible system footprint at 38"W x 30"D.
Our Wall-Stacker are simple solutions that allow bulk fluid storage in constrained locations such as bay ends and pits. These tanks can be stacked in multi-fluid configurations up to four tanks high and must utilize steel wall straps which secure the storage system to a wall. Store and dispense multiple oils, chemicals and industrial fluids in a reliable, clean, safe and efficient stackable poly tank configuration.